This Oathkeeper Red Damascus - Book Version of Game of Thrones is now available. The sword blade is from High carbon damascus steel with red and black patina treatment. The Hilt is 24k gold plating with a matte finish and antique wash. The grip is wrapped in Red leather. 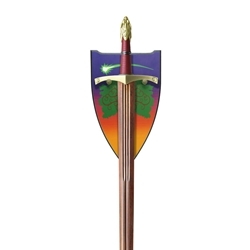 Oathkeeper comes with a Silkscreened fiber board mounting Plaque. "Nor I, my lord," said the armorer. "I confess, these colors were not what I intended, and I do not know that I could duplicate them. Your lord father had asked for the crimson of your House, and it was that color I set out to infuse into the metal. But Valyrian steel is stubborn. These old swords remember, it is said, and they do not change easily. I worked half a hundred spells and brightened the red time and time again, but always the color would darken, as if the blade was drinking the sun from it. And some folds would not take the red at all, as you can see. If my lords of Lannister are displeased, I will of course try again, as many times as you should require, but - " "No need," Lord Tywin said. "This will serve." "Magnificent." Even in hands as unskilled as Tyrion's, the blade felt alive. "I have never felt better balance." "It is meant for my son." Plaque: Silkscreened fiber board. Includes mounting hardware.